DETROIT – The Montague football team saw its fair share of tough opponents this season. 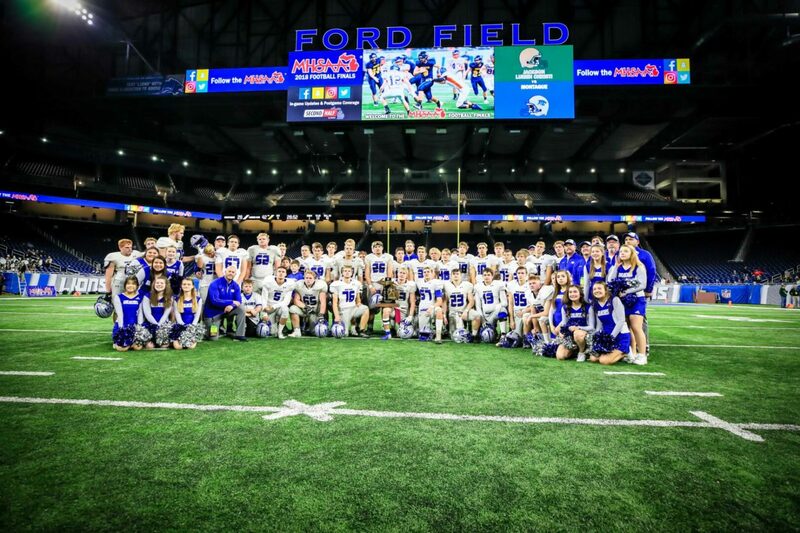 But on Friday, the Wildcats ran into a true powerhouse in Jackson Lumen Christi, which claimed its third consecutive Division 6 state championship by defeating Montague 42-28 at Ford Field in Detroit. Montague certainly put up a fight. The score was tied 14-14 at halftime. But the Titans outscored the Wildcats 28-14 in the second half to pull away with the victory. Montague head coach Pat Collins said depth – Lumen Christi had 15 more players than the Wildcats – made a difference as the game wore on. 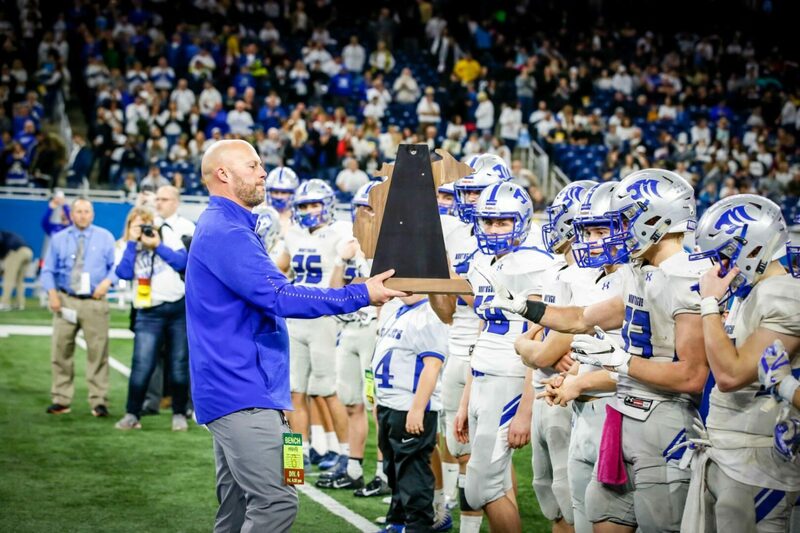 “We ran out of gas,” said Collins, whose team finished 11-3 on the season and won the West Michigan Conference championship, as well as district and regional titles. “They’re folding guys in all the time. We don’t have those guys. Another major problem for Montague was Lumen Christi senior running back Nick Thomas, who ran for 249 yards and two touchdowns on 28 carries, for an 8.9 yard per carry average. 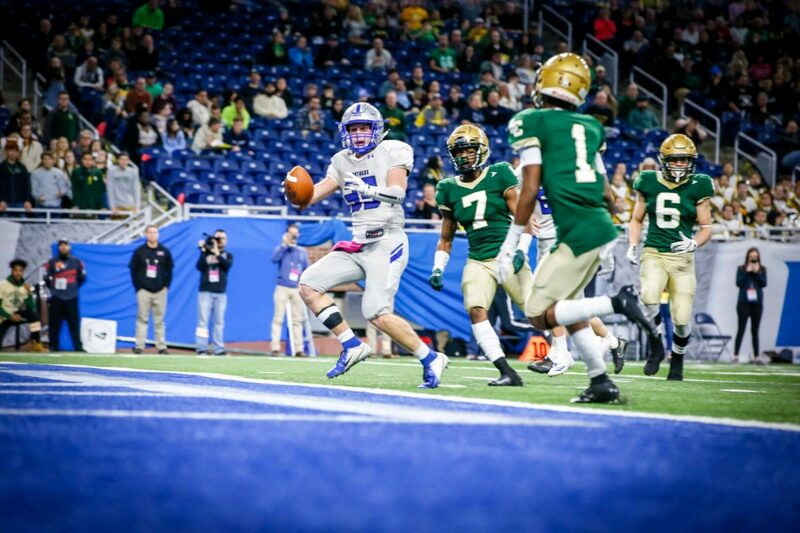 The rushing yards were the eighth most for a single player in a Michigan state title game. Thomas wasn’t the only Titan running wild. Lumen Christi piled up 348 yards on the ground with four touchdowns on 49 carries, for a 7.1 yard per carry average. While the Wildcat defense struggled to stop the run, the offense also struggled to get anything going, beyond the performance of senior running back Bryce Stark. Up until its final two offensive possessions, which accounted for 140 yards, the Montague offense had only totaled 176 yards. Of the 168 rushing yards Montague had on the day, Stark accounted for 156, with two touchdowns on 19 carries. Early on it appeared that Montague had the tools to stick with Lumen Christi. The Wildcat defense got off to a good start, forcing the Titans to punt on their first two possessions. On Montague’s second possession, Stark broke loose for a 57-yard touchdown run on the first play from scrimmage, giving the Wildcats a 7-0 lead with 5:29 left in the first quarter. That lead held up until the third play of the second quarter, when Thomas scored on a 57-yard touchdown run of his own, making the score 7-7 with 9:55 left in the second quarter. The Titans took a 14-7 lead on their next possession when quarterback Joe Barrett found Cy’Aire Johnson with a 40-yard touchdown pass with 7:09 remaining in the first half. Montague’s Luke Marsh helped set up the tying score when he forced a fumble that was recovered by Drew Collins at the Titans’ 43-yard line. Four plays later, Stark broke loose for his second touchdown run of the day, covering 21 yards and tying the game at 14-14 with 1:17 left in the half. But it was all Lumen Christi in the final two quarters. Montague was forced to punt to begin the third quarter, and the Titans drove 52 yards over eight plays, capped by a seven-yard TD run by Thomas. On the ensuing possession, a mishandled snap led to a Wildcat fumble, setting the Titans up at the Montague 24-yard line. Five plays later, Barrett found Dayton Keller with a five-yard touchdown pass, and suddenly Lumen Christi led 28-14. Montague turned the ball over again on its next possession, giving the Titans the ball at their own 40-yard line. On the first play of the fourth quarter, Thomas found a giant hole to score a 29 yard touchdown, making the score 35-14. After the Wildcats turned the ball over on downs, Lumen Christi’s Brock Fitzpatrick scored from 24 yards out to give his team a 42-14 lead. The Wildcats didn’t give up, however. They added a score with three minutes remaining when Drew Collins completed a 49-yard touchdown pass to Brennan Schwarz, making the score 42-21. The Montague defense then forced a fumble and took over at their own 23 with 1:28 remaining. On the first play of the drive, Collins completed another pass to Schwarz, who broke free in the secondary and scampered to the end zone for a 77-yard touchdown. That made the score 42-28 with 1:15 remaining. But after an unsuccessful onside kick by Montague, the Titans were able to run out the clock to claim yet another state title. Drew Collins threw for 142 yards, with two touchdowns and two interceptions, on 5-for-12 passing. Schwarz accounted for 125 yards and two touchdowns on two catches. Sebastian Archer led the Montague defense with an interception and fumble recovery. Mark Vanderleest had 12 tackles while Schwarz added nine. Barrett passed for 79 yards and two touchdowns for Lumen Christi. The Titan defense was led by Thomas with 10 tackles, including two sacks, while Bobby Willis had two interceptions. Overall, the Montague senior class leaves the program with 39 wins over the last four seasons, a mark that Coach Collins hopes they’ll be proud of. The impact on the program isn’t lost on Archer.